In this section I will deal with converting loco kits to S7 standards, with scratch building we do not have any problems as we set out the work to scale standards at the out set of building. With the high majority of loco and rolling stock kits designed for the old-fashioned, out of scale “0”gauge track standard of 32mm, building stock to S7 (33mm gauge) standards takes a bit of extra work. Somebody once said to me that “the only difference between an O gauge and S7 loco was that you had to alter the gauge of the wheel sets”, well there’s a bit more to it than that! It’s not bad news for anyone contemplating working to S7 standards for the first time if you bear in mind that the loco kit sitting on the workbench in front of you is probably not dimensionally correct. By this I mean that the kit manufacturer has probably distorted a few areas on the superstructure and chassis for the narrower than scale track gauge. I’m talking here about Steam locomotives, diesels, electrics and rolling stock are a different matter that I will deal with another time. My personal opinion is that O gauge should have been scrapped at the offset and true scale 7mm/ft 33mm gauge adopted, would have made life so much easier, but I wont go into the history of all that here. Most, if not all, steam loco kits/models are split at footplate level with the chassis being held to the body by small machine screws usually one at each end, in some cases I have a method that only uses one screw which I will explain in more detail later. On a real steam locomotive the frames support the boiler by being bolted to the cylinder block at the front end, which also supports the smokebox and at the rear with brackets supporting the firebox( but not bolted as to allow for expansion), and the cab. At either end of the frames the buffer beams are bolted to brackets and in the case of tender loco’s the drag box under the cab which is desigened to take the stresses and load of the tender via the draw bar. Firstly I will consider a simple kit built inside cylinder 0-6-0. Loco’s with outside cylinders have other considerations that I will explain later. When we construct our models the normal method in kit form is to build the boiler, cab and runningplate all as one unit and this sits on our chassis. If you are considering building to S7 standards and have not joined the S7 Group then I reccomend that you do www.scaleseven.org.uk you will recieve a welcome pack with all the standards set out (stock and track) and other useful information plus there is the S7 stores with components available both for stock and track building. When setting out to build a loco to S7 standards you will idealy have found a G.A. drawing to work from, this should have dimensions on it for you to work out any alterations that need to be made to the kit that you are using. One of the first things to consider are the wheel splashers, if the loco you are building does not have these then it’s not a problem, you’ll find with some kits that they are wider inboard than scale so that they cover the wheels on a F/S chassis. With our S7 chassis being wider and to scale check that the clearances are not too tight on the wheels especially if you have built in some sideplay. The J15 kit in the photo’s above was ok just, this is a Connoisseur kit, but on their 3F 0-6-0t kit I had to open out the cut outs in the running plate as they are not to scale dimensions. The running plate, or footplate as some call it, also needs to be altered on a F/S kit as this will over hang the chassis frames inboard where as it should just finish flush with the insides of the frames in our models as this supports any sections of upper parts of the chassis frames seen above the running plate. With tender loco’s check also that the tender has clearance for a scale width chassis. 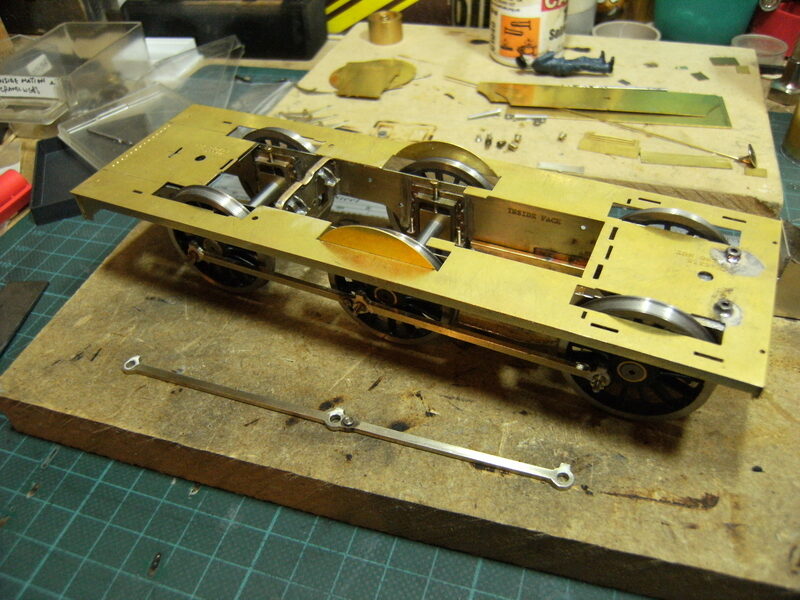 With tenders that have outside frames most if not all that I have encountered have a seperate sub chassis with inside bearings, this is fine in S7 as long as you check that the outside frames clear the outsides of the wheel sets, obvious really, but check the kit dimensions before assembling it! When building a S7 locomotive, using a kit, my prefered method is to scratch build the chassis with profile milled components, but I realise that not every one will have this facility or desire to do so. It is entirely possible to use the frames that are supplied in the kit, just throw the the F/S spacers in the spares/scrap box and cut new spacers to the new dimensions. If you are working to dead scale o/a frame dimensions it is vital to check not only the thickness of the frame material but also how far the hornblocks/axle boxes protrude through the frames because if they do they may exceed the back to back measurement of the wheel sets. Brass spacer material is available to members of the S7 Group from the stores, there are six sizes ranging from 24.74mm to 28.08mm width by approximatly 150mm in length.